LOS ANGELES — "Solo: A Star Wars Story" is losing momentum quickly at the box office, even with a relatively quiet weekend free of any new blockbuster competition. After an underwhelming launch, the space saga fell by 65 percent in weekend two, with $29.3 million from North American theaters, according to studio estimates on Sunday. The 65 percent drop is one of the highest in recent "Star Wars" history, although it is less steep than the second-week fall of the franchise's last film, "Star Wars: The Last Jedi," which slid by 67.5 percent in weekend two in December — but that was also after a $220 million debut. Internationally, "Solo" added $30.3 million, for $264.2 million worldwide. 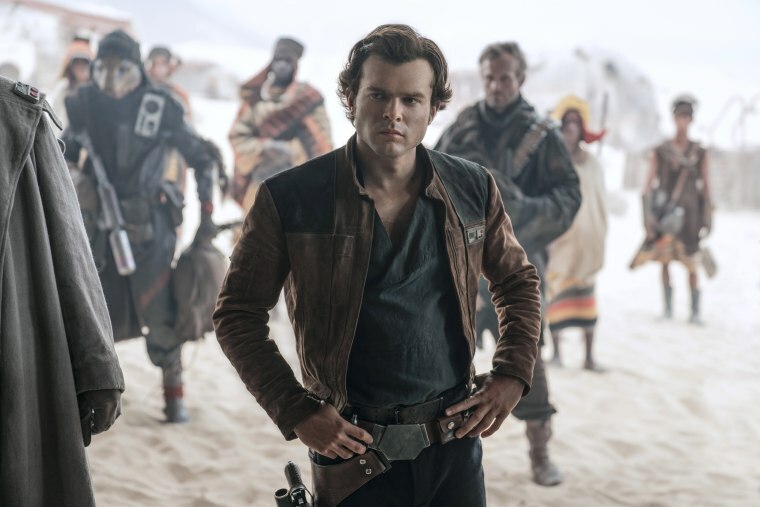 Paul Dergarabedian, the senior media analyst for comScore, said all the media attention to "Solo's" less-than-impressive opening weekend numbers could have actually negatively affected its second-weekend earnings. "Box office got conflated with perceived value of the movie, and that might have affected its second weekend," Dergarabedian said. "Sometimes, news of the box office can impact a movie's bottom line." He noted that in comScore's audience survey, most of the more than 1,000 people who were polled "really liked" the movie. "Solo's" tumble brought it even closer to "Deadpool 2," which was in its third weekend in theaters and still managed to reel in an estimated $23.3 million to take second place. With a domestic total of $254.7 million and a crowded marketplace, with both "Solo" and "Avengers: Infinity War" surrounding it, "Deadpool 2" is still only about $30 million behind where the first film was in its third weekend. Shailene Woodley's lost-at-sea drama, "Adrift," fared the best of the three newcomers, which included the horror pic "Upgrade" and a Johnny Knoxville comedy, "Action Point." "Adrift," from STX Entertainment, washed up in third place with $11.5 million, while the others struggled to make a significant impact. "Upgrade" opened in sixth place, with $4.5 million, behind both "Avengers: Infinity War" ($10.4 million) and "Book Club" ($6.8 million), and "Action Point," which wasn't screened for critics, landed in ninth place, with a dismal $2.3 million. This weekend also saw a few smaller studio landmarks for Magnolia Pictures, whose Ruth Bader Ginsburg documentary, "RBG," became its highest-grossing film ever, with $7.9 million, and Pantelion Films, which scored a similar feat with "Overboard," which is now up to $45.5 million. Even with "Solo's" stumble, the year-to-date box office is still up by 6.2 percent as June kicks into gear with some big movies on the horizon, including "Ocean's 8," "Incredibles 2" and "Jurassic World: Fallen Kingdom." Estimated ticket sales for Friday through Sunday at U.S. and Canadian theaters, according to comScore. If available, the latest international numbers for Friday through Sunday are also included. Final domestic figures will be released Monday.